The Victorian photocollage show currently on display at the Art Gallery of Ontario adds a new chapter to the history of montage and collage. The show consists of pages from a series of albums produced by British society women in the mid-nineteenth century. The pages cut and paste heads from cartes de visite, society portrait photographs, onto animals, exotic scenes and domestic interiors, playfully juxtaposing and arranging connections between families. The cartes de visite were the first mass produced commercially available photographs, enabling a relatively large group of people to have photographic images of Queen Victoria and the like, which they collected in albums. 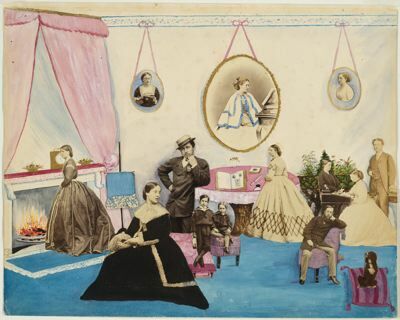 Society women like Lady Filmer, who is pictured above at work with knife and glue at her pink table, remixed such photographs against watercolor backgrounds, for the amusement of guests. The albums functioned very much as social networking sites like Facebook do today — except that these albums are literally “books of faces”, discreetly revealed to a visitor one wants to impress, who might leave their own carte de visite on the table. It’s still commonplace to think of montage and collage as primarily modernist or avant garde practices, even though they’re clearly part of advertising or subcultures like hip-hop. I make the argument in In Praise of Copying that montage is an essential part of folk-cultures, where cut and paste techniques, appropriation of materials from the environment, collaboration and collective authorship are basic strategies of cultural production. I was particularly interested in things like quilting or cooking recipes: semi-anonymous, stereotypically feminine arts that involve the use of pattern to transform pre-existing materials — in other words, to make highly charged copies. The Victorian photocollage show certainly makes one question to what degree montage is really an inherently radical practice. If the montage of Berlin dada aimed at the destruction of the images that support a particular arrangement of society, these images playfully participate in constructing such arrangements. Playing With Pictures, the book that accompanies the exhibition, does a good job of situating the photocollage albums within the Victorian cultural context of upper class amusements such as the tableau vivant. 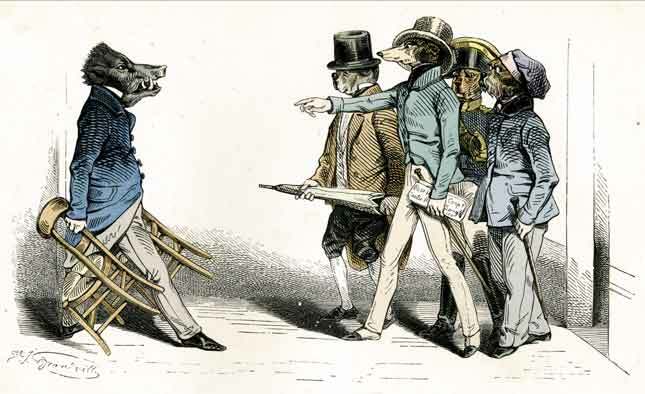 The “surreal” juxtapositions of animals and humans found in the albums are already there in Grandville’s Parisian periodical illustrations of the 1840s — but without the use of photographic material. Susan Buck-Morss traced this tradition back through the Baroque in her Dialectics of Seeing. For Buck-Morss, and for Walter Benjamin, such images were bourgeois fantasies of the commodified utopia of nineteenth century capitalism. That analysis works well for Victorian Photocollage too. Looking through the albums, it’s striking how often human faces are grafted onto the bodies of animals (second nature as nature), objects such as bags, juggling balls, mirror and cups (commodification), and presented within highly staged domestic spaces that look like IKEA showrooms (’nuff said). As much as the albums are aimed at the consolidation of aristocractic Victorian society, the encroaching future, certainly bourgeois, but with the masses not far behind, is there in the gaps and disjunctures within the image, whose meaning is waiting to be realized. The mass availability of cartes de visite of the Prince of Wales allowed for his appropriation into other social milieux … Monty Python dreamt up a hundred years in advance by upper class Victorian women.